As someone who lives with rheumatoid arthritis, it’s always good to get through a few weeks, or even months, without a significant pain flare up. Unfortunately, almost everyone with the condition will suffer a flare up at some time or another. They won’t usually occur for no reason. Here we’re looking at the most common triggers for rheumatoid arthritis flare ups. 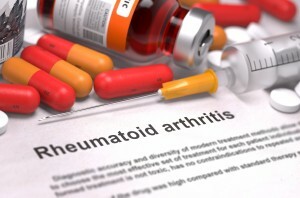 Many rheumatoid arthritis medications supress the immune system which can mean you are at higher risk from infection and even something as simple as the common cold can result in a flare up. A study carried out in 2012 by the Mayo Clinic in Minnesota[i] and then published in the Arthritis and Rheumatism Journal found that nearly 50% of the 584 rheumatoid arthritis patients they followed had more than one infection that was serious enough to require hospitalisation. Overexertion is a leading trigger for rheumatoid arthritis inflammation and overexertion that leads to fatigue can result in a rheumatoid arthritis flare up. Managing your lifestyle to avoid situations where you are pushed beyond your manageable limits is something you need to consider and you also need to be ready to take time out and a rest whenever your body signals that it needs it. Both doctors and people living with rheumatoid arthritis have come to an agreement over certain foods leading to flare ups but the issue lies in the fact that the foods that cause flare ups are different for everybody. A study on food triggers would be very difficult as so many people have so many different reactions and therefore it is important to have a close understanding of your own condition, pinpoint your own food triggers, if you have any, and then avoid those foods wherever possible. Though pregnancy is not on the cards for all people with rheumatoid arthritis, if you do plan to start a family it is worth noting how pregnancy can affect the condition. Being pregnant causes the immune system to shut off and often it results in the main and most painful symptoms of rheumatoid arthritis going into remission. However, the months just after giving birth are often a trigger for a painful rheumatoid arthritis flare. A 2011 review of studies into rheumatoid arthritis and pregnancy found that around 75% of women experience remission from their symptoms during pregnancy but as many as 90% then experience a flare up during the first year after giving birth. If you have any questions about rheumatoid arthritis or would like to book an appointment with Dr Stephanie Barrett then please get in touch here.